Whenever the first NASA astronauts arrive on Mars, they will likely have MIT to thank for the oxygen they breathe—and for the oxygen needed to burn rocket fuel that will launch them back home to Earth. 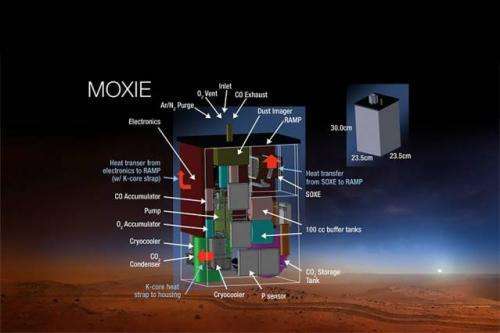 MOXIE—short for Mars OXygen In situ resource utilization Experiment—was selected from 58 instrument proposals submitted by research teams around the world. The experiment, currently scheduled to launch in the summer of 2020, is a specialized reverse fuel cell whose primary function is to consume electricity in order to produce oxygen on Mars, where the atmosphere is 96 percent carbon dioxide. If proven to work on the Mars 2020 mission, a MOXIE-like system could later be used to produce oxygen on a larger scale, both for life-sustaining activities for human travelers and to provide liquid oxygen needed to burn the rocket fuel for a return trip to Earth. "Human exploration of Mars will be a seminal event for the next generation, the same way the moon landing mission was for my generation," says Michael Hecht, principal investigator of the MOXIE instrument and assistant director for research management at the MIT Haystack Observatory. "I welcome this opportunity to move us closer to that vision." To do this, MOXIE will be designed and built as what Hecht calls a "fuel cell run in reverse." In a normal fuel cell, fuel is heated together with an oxidizer—often oxygen—producing electricity. In this case, however, electricity produced by a separate machine would be combined with carbon dioxide from the Martian air to produce oxygen and carbon monoxide in a process called solid oxide electrolysis. "It's a pretty exotic way to run a fuel cell on Earth," Hecht says, "but on Mars if you want to run an engine, you don't have oxygen. Over 75 percent of what you would have to carry to run an engine on Mars would be oxygen." Of course, setting up a system to create oxygen that human explorers could breathe would be extremely helpful for a mission of any duration. But there's an equally important reason to be able to produce oxygen onsite, Hecht says: "When we send humans to Mars, we will want them to return safely, and to do that they need a rocket to lift off the planet. That's one of the largest pieces of the mass budget that we would need to send astronauts there and back. So if we can eliminate that piece by making the oxygen on Mars, we're way ahead of the game." According to Hecht, a long-term plan for getting humans to Mars—and back—would look something like this: First, a small nuclear reactor would be sent to the Red Planet along with a scaled-up version of the MOXIE instrument. Over a couple of years, its oxygen tank would fill up in preparation for human visitors. Once the crew arrives, "they have their power source, they have their fuel, and the infrastructure for the mission is already in place," Hecht says. "That's the piece we're after." To be sure, MOXIE won't be the only instrument aboard the Mars 2020 mission. It will occupy valuable space on a rover that will also conduct other important scientific experiments—such as searching the Martian soil for signs of life. So why do scientists and engineers need to demonstrate that they can produce oxygen on the surface, when they're confident they can make that reaction happen on Earth? "If you were one of those astronauts depending on an oxygen tank for your ride home, I think you'd like to see it tested on Mars before you go," Hecht explains. "We want to invest in a simple prototype before we are convinced. We've never run a factory on Mars. But this is what we're doing; we're running a prototype factory to see what problems we might come up against." To develop MOXIE, MIT will partner with NASA's Jet Propulsion Laboratory (JPL) in Pasadena, Calif. JPL will lead design and development of the payload, while MIT will establish the mission architecture, oversee the development, and plan operations on the surface of Mars. At MIT, MOXIE's home will be the Haystack Observatory, an interdisciplinary research center in Westford, Mass., that specializes in radio science related to astronomy, atmospheric science, and applied measurement of the Earth known as geodesy. Hecht admits that developing and building the MOXIE instrument will be something of a departure from Haystack's typical projects, but he and his colleagues are excited to take on the challenge. "Haystack has been involved in the space program since its inception, even before it was officially Haystack Observatory," Hecht says. "We really pride ourselves on our ability to pioneer new, ultraprecise scientific instrumentation and get it out into the field. We're kind of a bridge between an engineering production shop and a fundamental science shop, so this plays to our strength in every way but the fact that there's no radio science [on Mars 2020]." Of course, Hecht and his Haystack colleagues won't be working on MOXIE in a vacuum. The instrument will also benefit from the expertise of Jeff Hoffman, a former astronaut and professor of the practice in MIT's Department of Aeronautics and Astronautics. Associate Professor of Nuclear Science and Engineering Bilge Yildiz, who has unique experience with the technology that will fly on the MOXIE experiment, will also play an important role. "It's a collaboration I never expected, between nuclear engineering, AeroAstro, and Haystack Observatory," Hecht says. "But in the end, our leadership team ended up with a very competitive product." When will humans actually get to Mars? An independent mission known as Mars One aims to send humans on a one-way trip to the Red Planet in 2024—but critically, the explorers who have signed up for that mission know they won't be returning. Sending humans on a government-funded return trip will take much more effort, both in terms of science and technology and political will. "It's not a science and engineering question, it's a political and programmatic question," argues Hecht, who believes it's not unreasonable to think NASA could launch humans on a return trip to Mars in 20 years. "What that will take is, I'd say, a political bipartisan commitment, a sustained investment, and the best and brightest minds of the generation, just as Apollo did," Hecht says. "It's a really challenging project, just as Apollo was. It's doable, it won't break the bank in the United States, and we can afford it, but it's a large commitment. "I was thinking about [President John F.] Kennedy's speech," Hecht adds, "when he talked about going to the moon not because it's easy, but because it's hard. And I was really struck by what came after that quote, the part that nobody remembers. He said, 'Because that goal will serve to organize and measure the best of our energies and skills, because that challenge is one that we are willing to accept, one we are unwilling to postpone, and one which we intend to win.' That just said it. We will get to Mars in 20 years when we are willing to embrace that challenge." A few years ago, in-situ resource production was something being discussed, but not something it seemed like was being taken too seriously by NASA. Now they're donating extremely valuable rover space to doing just that. It looks like we're finally taking serious steps towards getting a human on that planet. Or just let Musk/SpaceX do it for $5B. They are in the last stages of the landing capsule for Mars or the moon plus of course the space station it's already docked to several times. They will shortly have the heavy lift needed in reusable rockets for a fraction of big space, gov version. The question is why can't other build as good for as low cost and capable as SpaceX's are?